Iran and six world powers last month achieved an apparent breakthrough in negotiations over Tehran’s controversial nuclear program when the parties reached a first-phase agreement on a six-month deal that will halt Iran’s most sensitive nuclear activities and increase international monitoring of its nuclear program in exchange for some relief from sanctions that have hurt Iran’s economy. The deal was signed in Geneva in the early hours on Nov. 24 after four days of talks. “For the first time in nearly a decade, we have halted the progress of the Iranian nuclear program, and key parts of the program will be rolled back,” President Barack Obama declared shortly after the agreement was announced. Obama said the agreement “cut[s] off Iran’s most likely paths to a bomb” and “creates time and space” to negotiate a comprehensive agreement. Iranian President Hassan Rouhani also welcomed the deal. He said Nov. 24 that Iran’s nuclear program, including its “right to enrichment,” was recognized and the deal could serve as a basis for further negotiations. Rouhani appointed the new team after he took office in August. Iran maintains that its nuclear activities are entirely peaceful, but the international community is concerned that Tehran is keeping open the option to pursue nuclear weapons. The international community began negotiating with Iran over its nuclear program in 2003. Iranian Foreign Minister Mohammad Javad Zarif led the Iranian team. EU foreign policy chief Catherine Ashton led the negotiating team for the P5+1. U.S. Secretary of State John Kerry joined the negotiations Nov. 23, as did the foreign ministers from the other P5+1 countries. 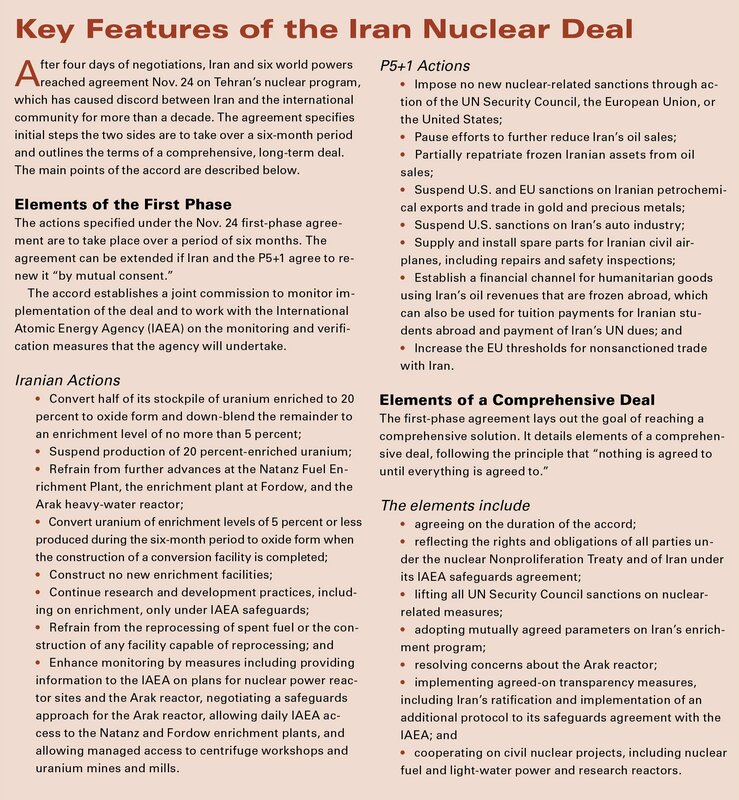 The first-phase agreement is a four-page document that lays out specific actions for Iran and the P5+1 to take over the course of six months and sets the goal of reaching a “comprehensive agreement” during that time (see box). The first-phase agreement can be extended beyond six months if the parties agree to do that. The six-month time period will begin once the verification and enforcement mechanisms have been established, including creation of a joint committee to monitor implementation of the agreement. Implementation will begin after the committee is set up. In a Nov. 24 press conference, Kerry said the course that Iran is required to take “locks the most critical components of a nuclear program into place and impedes progress in those critical components in a way that actually rolls back the stockpile of enriched uranium and widens the length of time possible” for Iran to move quickly toward a bomb. According to the text of the agreement, Iran is required to eliminate its stockpile of uranium enriched to 20 percent and maintain its stockpile of 3.5 percent-enriched uranium at its current size. Over the next six months, Iran is to convert the 3.5 percent-enriched uranium that it produces to a form less suitable for further enrichment. Iran says it produces uranium enriched to 20 percent to fuel its research reactor and to 3.5 percent for power reactors that it plans to build in the future. Iran’s stockpile of 20 percent-enriched uranium is a primary concern for the P5+1 because it can be more easily enriched to weapons grade. Iran currently has about 200 kilograms of uranium enriched to this level in its stockpile, according to a Nov. 14 report from the International Atomic Energy Agency (IAEA). Independent experts estimate that 250 kilograms of 20 percent-enriched material, when further enriched to weapons grade, is enough for one weapon. The agreement also freezes installation or production of further centrifuges, which are used to enrich uranium, and construction of a heavy-water reactor at Iran’s Arak site. The reactor, when operational, would produce plutonium suitable for use in a nuclear weapon. But Iran is not known to have the facilities to separate plutonium from spent fuel. Monitoring and verification would be increased under the agreement. International inspectors would have daily access to Iran’s enrichment facilities at Natanz and Fordow and be permitted to visit other nuclear sites, such as Iran’s centrifuge production facilities. The IAEA had limited access to the Natanz and Fordow facilities prior to this agreement, but was not permitted to visit the centrifuge production plants and other sites that are part of Iran’s nuclear program. In return, Iran would be able to gain access to about $4.2 billion in frozen assets from its oil sales. Among other benefits for Tehran, the United States would suspend certain sanctions on Iran’s auto sector, petrochemical exports, and trade in gold and other precious metals. The “core architecture” of the sanctions regime, namely sanctions on the oil and banking sectors, “remains firmly in place” as negotiations continue, Kerry said. In a Nov. 26 interview, an official familiar with the negotiations said the language dealing with recognition of Iran’s uranium-enrichment capabilities was one of the more difficult parts of the negotiations, as both sides hold “entrenched positions” on enrichment rights. Iran maintains that it has the right to uranium enrichment under Article IV of the nuclear Nonproliferation Treaty (NPT), which guarantees states-parties access to nuclear technology as long as they adhere to their treaty obligations. Article IV does not specifically mention uranium enrichment. U.S. policy does not interpret access to enrichment technology as a right under Article IV. The first-phase agreement allows Iran to continue enriching uranium to a level suitable for use in a power reactor. In outlining the general framework for the comprehensive deal, the agreement does not explicitly recognize Iran’s right to enrichment, but says that the “comprehensive solution would enable Iran to fully enjoy its right to nuclear energy for peaceful purposes under the relevant articles of the NPT in conformity with its obligations therein.” Iran would be allowed to maintain “a mutually defined enrichment programme with practical limits and transparency measures to ensure the peaceful nature of the programme,” the agreement says. Washington and Tehran made statements interpreting the language used in the first-phase agreement as supportive of their respective policy positions. Under the first-phase agreement, no new sanctions on Iran would be imposed during the six-month term of the pact. In his remarks following the signing of the agreement, Obama said that “now is not the time to move forward on new sanctions,” adding that it would “derail this promising first step.” If Iran does not meet its commitments under the agreement, however, the United States “will turn off the relief and ratchet up the pressure,” Obama said. In an interview with NBC on Nov. 24, Zarif said that the “deal would be over” if there are any new sanctions passed during the next six months. In Washington, senators are split on whether Congress should move ahead with more sanctions legislation. In a Nov. 24 statement, Sen. Dianne Feinstein (D-Calif.), chairman of the Senate Intelligence Committee, called the preliminary agreement a “giant step forward” and said it “should not be undermined” by an immediate move toward further sanctions. If Tehran upholds the terms of the agreement, “we will know that Iran is serious about reaching a final agreement,” she said. Sen. Saxby Chambliss (R-Ga.) said that additional sanctions pressure should be placed on Iran. In a Nov. 25 interview with ABC, Chambliss said that there is a “strong movement” in the Senate to move ahead to tighten sanctions. But Chambliss, vice chairman of the intelligence panel, said that, in light of the agreement, Congress might have to delay the effective date for the sanctions until after the six-month first-phase agreement ends. The House of Representatives passed a bill in July that would expand restrictions on Iran, including a de facto oil embargo. Although the Senate has not moved forward on a bill similar to that one, several proposed amendments to the Senate version of the 2014 National Defense Authorization Act would impose further sanctions on Tehran. Those amendments could be considered when the Senate resumes debate on the defense bill in December. A Senate staffer told Arms Control Today in a Nov. 25 e-mail that there is a great deal of skepticism in Congress about Iran’s intention to follow through on the deal. He said it is likely that the Senate will consider passing sanctions as stand-alone legislation or as an amendment to the defense bill, which would likely include language “delaying imposition of the restrictions for six months.” The legislation also could include language to allow the sanctions to be imposed immediately “if Iran doesn’t follow through on the deal,” he said. Even if the legislation included language delaying imposition of further sanctions, moving forward on a sanctions bill would be “extremely damaging” to unity within the P5+1 and “send the wrong signals” to Tehran, the official familiar with the negotiations said in the Nov. 26 interview. In the Middle East, attitudes toward the deal were also mixed. Israeli Prime Minister Benjamin Netanyahu, perhaps the most vocal critic, described the deal as a “historic mistake” in a Nov. 24 statement. The Israeli Foreign Ministry issued a press release criticizing elements of the deal, saying that the first-phase agreement represented “unprecedented international recognition of Iran’s enrichment program” and “international acceptance” of the heavy-water reactor at the Arak site. In a Nov. 25 e-mail to Arms Control Today, a former Israeli official said that Israel would continue pressuring the United States over the next six months to negotiate a “better comprehensive deal” with Iran that requires it to “dismantle its nuclear facilities.” Unilateral military action by Israel is “unlikely to occur if the agreement is properly implemented,” he said. Saudi Arabia, historically at odds with Iran, issued a statement Nov. 24 saying that if there are “good intentions,” this agreement could be a first step toward a comprehensive deal. The framework lays out the goal of reaching a “mutually-agreed long-term comprehensive solution that would ensure Iran’s nuclear programme will be exclusively peaceful” and the broad outlines of a final deal. The final agreement would include “practical limits and transparency measures” for Iran’s enrichment program. It would lift sanctions “related to Iran’s nuclear program” imposed by individual countries, the European Union, and the UN Security Council and would provide for international cooperation on civilian nuclear projects, including nuclear fuel and light-water power and research reactors. An official involved with the negotiations said in a Nov. 24 interview that Iran was “satisfied by the language” in the first-phase agreement and by verbal assurances from the P5+1 that if Iran follows through on implementation of the deal, it will be permitted to continue “limited enrichment with intrusive monitoring” under the comprehensive agreement. But the official also said that the P5+1 is likely to insist on “partial dismantlement” of Iran’s uranium-enrichment facilities. That could include “shutting one of the enrichment facilities, and/or dismantling some of the installed centrifuges,” but “a final decision about enrichment limits has not yet been made,” the official said.